The Strivers' Dinner is an opportunity for Strivers to meet and unwind from their hectic lives while building connections with one another. It is also my sincere thank you to them for lending their time and gifts to help me bring my vision to life. For the first Strivers' Dinner, we did not stray far from our namesake Strivers' Row. We dined at Ponty Bistro, located directly across the street from the 139th St. block. The restaurant, specializing in unique African and French cuisine with Mediterranean influences, opened in 2010. 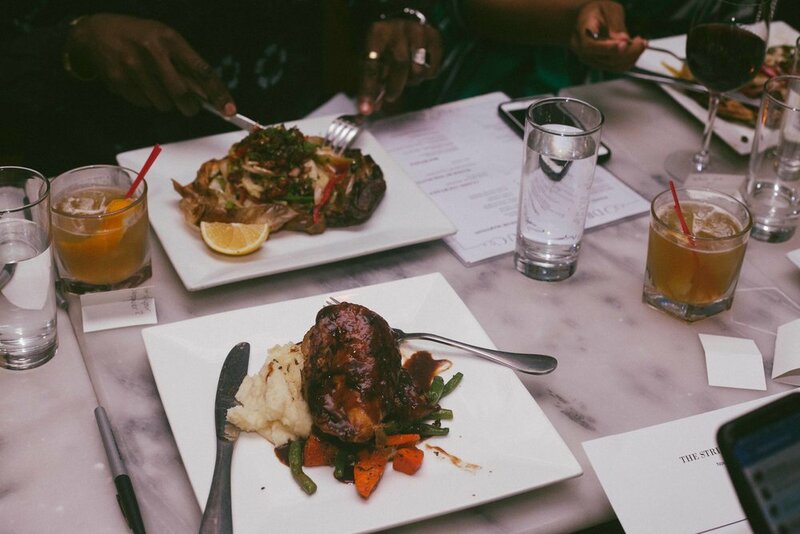 It was the fulfillment of a lifetime dream for Head chef Ejhadji Cisse and his first cousin Cheikh, who immigrated to the United States in 1995 from Dakar, Senegal and worked in some of New York's most high profile restaurants. The evening began on a high note as introductions came along with some exciting announcements of what lies ahead for some of the Strivers, and the energy never dropped. Over a few hours we shared opinions, outlooks and lots of laughs. It wouldn't be a young, Black gathering without a spirited discussion of who's #TeamLawrence vs. #TeamIssa, too. As we parted ways at the end of the night we all agreed that the time together was much needed and that we've got to do it more often! Exactly what I was hoping to hear.